First cut a 6" x 9" piece of white card stock and fold in half for the base, a 4 1/4" x 5 3/4" piece of pink for the middle layer, a 4" x 5 1/2" piece of white card stock for the front layer, a 1 3/4" x 4" piece of green card stock for the strip's edge, and a 1 1/2" x 4" piece of white for the bottom strip. Next emboss the larger piece of white card stock with a Stampin' Up! 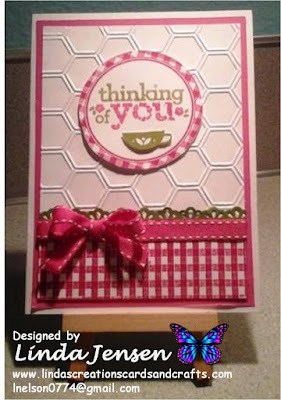 Honeycomb embossing folder and set it aside. Then stamp the plaid circle in Stampin' Up! Melon Mambo ink, cut it out, then stamp the sentiment in the center with Stampin' Up! Old Olive and Melon Mambo inks. Next stamp the cup on scrap paper in Old Olive ink, cut it out and attach it to the sentiment with a mini pop dot. Then attach the sentiment to the embossed background with a mini pop dot. Next cut the edge of the green strip with a Stampin' Up! Finishing Touch Edgelit Die then on the white strip stamp the plaid background in Melon Mambo ink, attach it to the green strip, attach the green strip to the background, add the ribbon and attach the background to the pink card stock, finish assembling the card and enjoy!